As I have mentioned before and will probably mention many times before the event, I'll be heading to Shanghai in a few weeks to go and see the solar eclipse with the longest duration of totality this century. I'll be in and around Shanghai for a couple of weeks, and have my eyes set on a few locations for the event itself, though that depends in large part on the weather. Of course I hope not only to see the event, but also to get some good photos of it, and that requires some preparation on my part. A couple of weeks back I ordered a high grade A4 solar filter sheet and have just had a chance to cut out a part of it to make a trial filter box for my camera. I've made a simple setup with cardboard for now and plan on making something more solid for when I make the trip East. The current setup goes over the end of my 70-300mm lens which I've used on numerous occasions now for solar system photography, with moderate success. Sadly although we are finally coming out of the period of minimum solar activity, with the first sunspots for many months (ok, there are some subtleties to that statement), right now the surface looks pretty featureless and so there's not much to search for with the new piece of kit. 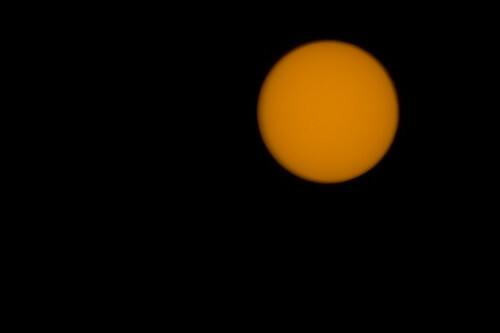 Still as a first try it's looking pretty good and I'll be keeping an eye on the sunspot activity over the next few weeks.